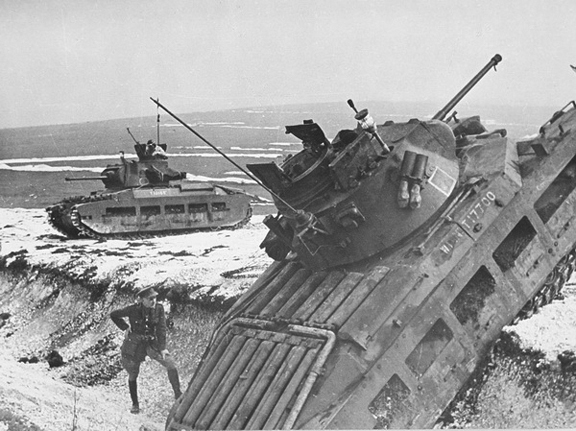 As stated earlier in Part 1, the main Canadian users of the Matilda tank were the 12th Canadian Army Tank Battalion (The Three Rivers Regiment (Tank)), and 14th Canadian Army Tank Battalion (The Calgary Regiment (Tank)) (hereafter referred to as the Calgary Regiment, and the Three Rivers Regiment, respectively), of the 1st Canadian Army Tank Brigade, and No. 1 Canadian Ordnance Reinforcement Unit. An example of the Infantry Tank, Mark III, Valentine, that the 1st Canadian Army Tank Brigade was to have been equipped with. Source: MilArt photo archive. 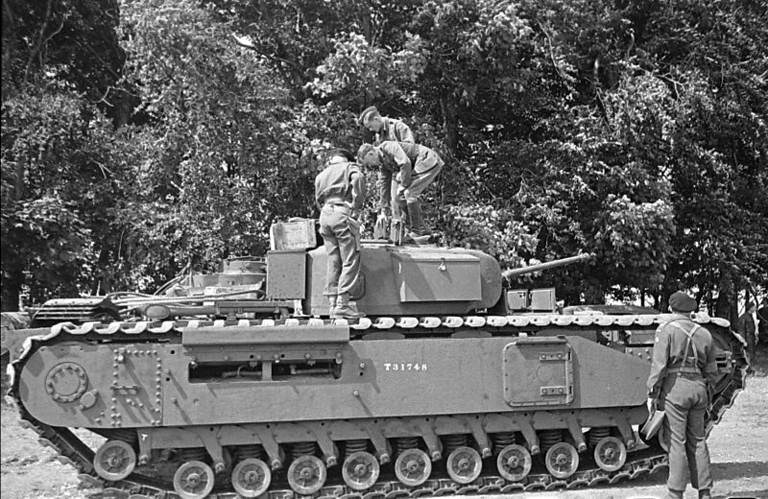 An example of the new Infantry Tank Mark IV, Churchill (A22), that came straight from the Vauxhall Motors production line, that was issued to the Ontario Regiment on 10 July 1941, being inspected by Lieutenant-General A.G.L. McNaughton (hatless) and Brigadier F.F. Worthington (standing on the upper track run, with his back to the camera). Source: authors’ collection. 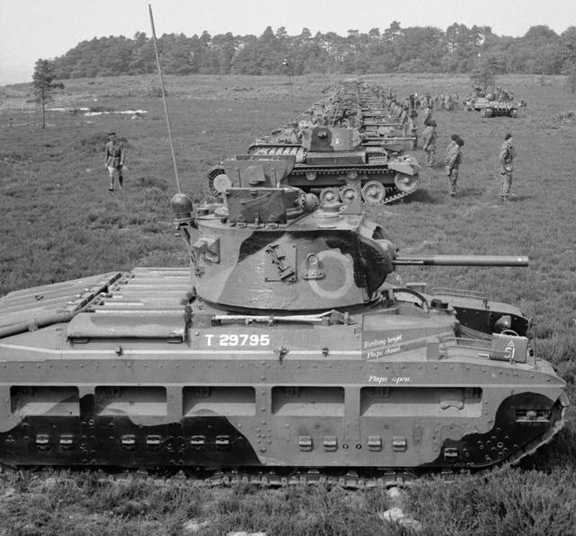 A column of Matilda tanks of the 12th Canadian Army Tank Battalion (The Three Rivers Regiment (Tank)), led by T10163, a Mark IIA* Matilda III, which was taken-on charge of the Canadian Army Overseas, and issued to the Three Rivers Regiment, on 16 July 1941. Source: MilArt photo archive. In the background is T10163, a Mark IIA* Matilda III, taken-on charge of the Canadian Army Overseas on 16 July 1941, and in the foreground is T17700, a Mark IIA* Matilda III, taken-on charge of the Canadian Army Overseas on 14 July 1941. Both of these tanks served with the Three Rivers Regiment, while in Canadian service. Source: MilArt photo archive. In the foreground is a Mark IIA* Matilda III Close Support, armed with the 3-inch howitzer (with the co-axial 7.92-millimetre Besa machine gun mounted on it’s right). Although this particular tank (T29795) did not serve with the Canadian Army Overseas, the Mark IIA* Matilda III Close Support tanks that were issued to the Calgary, and Three Rivers Regiments, respectively, would have appeared as such. Source: IWM (H 11654). five troops, with three infantry tanks each with a total strength of 154 all ranks per squadron for a total authorized tank battalion strength of 612 all ranks. A Mark IIA* Matilda III of the Calgary Regiment, barring the War Department number T10159, which was taken-on charge of the Canadian Army Overseas, and issued to the Calgary Regiment, on 14 July 1941. 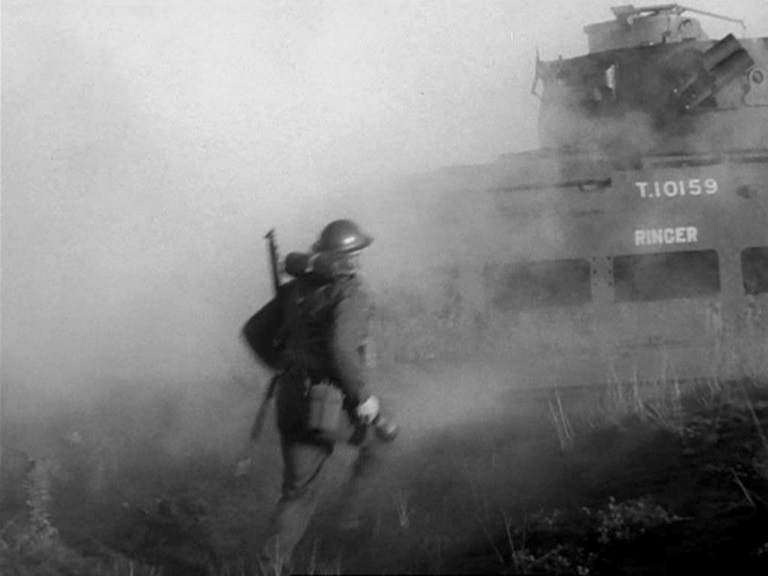 Although not visible, this tank was named RINGER, and served with Battalion Headquarters of the Calgary Regiment, until being withdrawn from Canadian service and returned to the British on 1 December 1941. Source: MilArt photo archive. The 1st Canadian Army Tank Brigade was to have been equipped with the Canadian-built Infantry Tank, Mark III, Valentine, before leaving Canada. However, because of delays in Canadian tank production, Lieutenant-General McNaughton set out to persuade the British War Office to lend tanks to the incoming 1st Canadian Army Tank Brigade. These would be replaced with Canadian-built tanks when Canadian production problems were overcome. With the added support of the British Army’s Commander of the Royal Armoured Corps, Major-General G. Le Q. Martel, he was successful in this endeavour. Immediately upon arrival in the United Kingdom, 1st Canadian Army Tank Brigade was able to draw equipment on a respectable training scale. 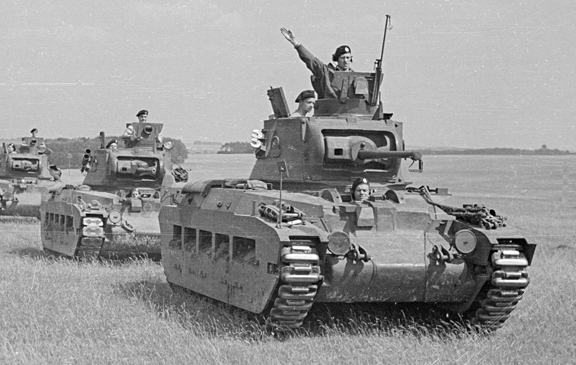 The Ontario Regiment was equipped with the new Infantry Tank Mark IV, Churchill (A22), straight from the Vauxhall Motors production line, while the brigade’s other two battalions, the Three Rivers Regiment and the Calgary Regiment were issued with the Infantry Tank Mark IIA*, Matilda III (with twin Leyland diesel engines, a 2-pounder Ordnance Quick Firing gun Mark IX or Mark X, and a co-axial 7.92-millimetre Besa machine gun mounted in the turret, and fitted with the No. 19 Wireless Telegraph Receiving and Transmitting set (a radio set)). 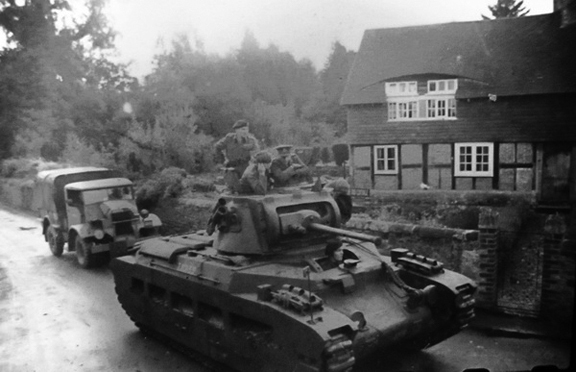 The British Directorate of Armoured Fighting Vehicles, also made arrangements, for officers and men of these two regiments, to attend courses on the Matilda, that they ran at three of the firms producing this tank. Each of these courses was five days in length, and were ran at the Vulcan Foundry Ltd., site at Newton-le-Willows, Lancashire, at the Grantham, Lincolnshire, site of Ruston & Hornsby Ltd, and at the John Fowler & Co., site at Leeds, West Yorkshire. Right-hand side view of T10159, RINGER, a Mark IIA* Matilda III, of Battalion Headquarters, the Calgary Regiment, during a demonstration of ‘Tank Hunting’ with a platoon of the 3rd Canadian Divisional Infantry Reinforcement Unit, in the vicinity of Headley, Hampshire, on 9 October 1941. Source: authors’ collection. 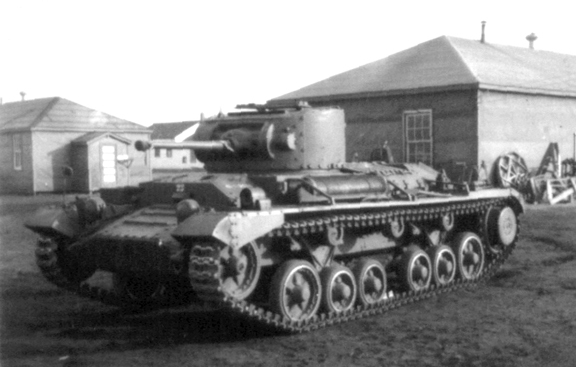 As with the Churchill tanks that the Ontario Regiment began to receive, the Matilda tanks that began being issued to the Three Rivers Regiment and the Calgary Regiment, were received from the British through No. 1 Canadian Base Ordnance Depot, Royal Canadian Ordnance Corps, located at Bordon Camp, Hampshire. No. 1 Canadian Base Ordnance Depot, as with the Churchill tanks, took the Matilda tanks onto Canadian charge, and after inspecting them for any mechanical faults, and insuring that all the appropriate tank tools and equipment for each individual tank were in place, and if not, noting what deficiencies (shortages) there were, passed them onto the charge of the receiving unit. By the end of July 1941, both the Three Rivers Regiment, and Calgary Regiment, held between them, 29 Mark IIA* Matilda III tanks, while Headquarters 1st Canadian Army Tank Brigade, held one Mark IIA* Matilda III Close Support tank, with a 3-inch howitzer in the turret. The war diary of the Three Rivers Regiment states that as of 31 July, they held on strength 11 Mark IIA* Matilda III tanks, thus leaving ten, as being held on strength of the Calgary Regiment. As mentioned at the end of Part 1, the Mark IIA Matilda II (powered by twin AEC diesel engines), and the Mark IIA* Matilda III (powered by twin Leyland diesel engines), could only be identified as such from the rear, by the simple fact, that the Mark IIA Matilda II had only had one exhaust pipe running down the left side of the engine deck, while the Mark IIA* Matilda III had an exhaust pipe running down each side of the engine deck. As can be seen in this photo, other then the exhaust pipe(s), both the Mark IIA Matilda II, and the Mark IIA* Matilda III were identical in appearance when viewed from the front. 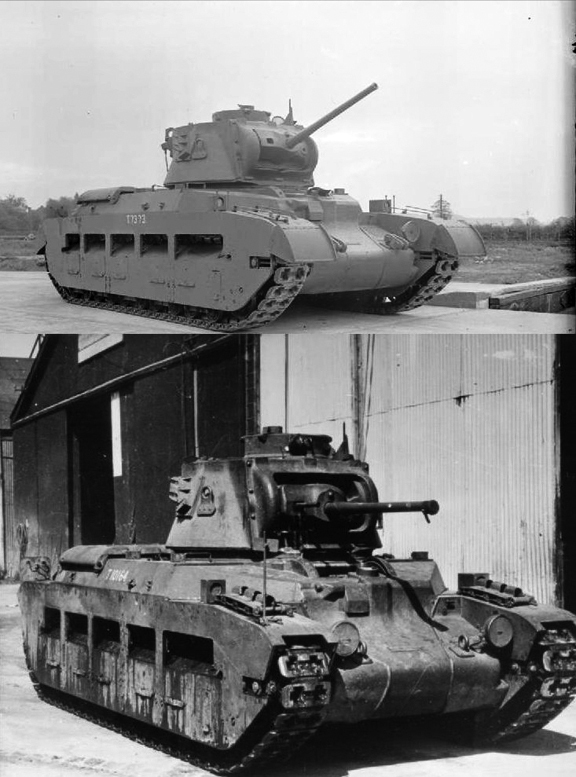 The top image is of a Mark IIA Matilda II (Source: IWM (KID 782)), while the bottom image, is of a Mark IIA* Matilda III (Source: IWM (MH 9264)). The month of October 1941, was the last month in which the Mark IIA* Matilda III tank, was issued to units of the 1st Canadian Army Tank Brigade, with a total of 18 having been received by months end. The war diary for the Three Rivers Regiment states that as of 31 October 1941, out of an entitlement of 45 infantry tanks, they held on strength a total of 42 Mark IIA* Matilda III tanks, while the war diary of the Calgary Regiment, reflects that out of an entitlement of 45 infantry tanks, they held on strength a total of 4 Mark IIA* Matilda III and two Mark IIA* Matilda III Close Support tanks. Of the 89 Mark IIA* Matilda III tanks held by the Three Rivers Regiment, and Calgary Regiment, as of 31 October, the 1st Canadian Army Tank Brigade Readiness Return reflects that 84 of these were ‘in action,’ with the remaining five as being ‘out of action.’ Both the Mark IIA* Matilda III Close Support tanks, held by the Calgary Regiment (one with “A” Squadron headquarters, and one with “C” Squadron headquarters), were shown as being ‘in action,’ on the Readiness Return of 31 October 1941.